In our country, we need to defend against extreme cold in the winter and extreme heat in the summer. The Armor line of windows were built for our environment by designing windows that address these environmental issues. The Armor series of windows are available in several configurations and options, ranging from comfort to industry-leading performance windows. Comfort glass works well in all climates and provides superior solar heat control. Energy Glass is designed for our cold climate and provides maximum heat gain and light. Energy Glass will reduce heating costs as the sun is used to provide maximum heat gain and excellent comfort. Performance Glass provides the best of both seasons by blocking the sun in summer and preventing heat loss in the winter. Same as the Performance + Glass provides the best year-round comfort and savings. Armor’s Antartik System cleverly reduces condensation by placing the glass closer to the warmer side of the wall. 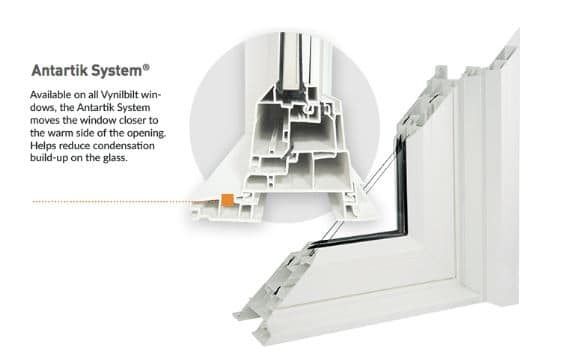 The Antartik System is available with all glass types.